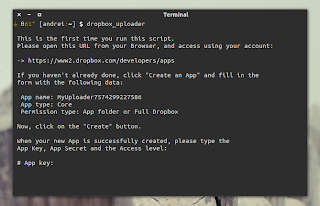 Dropbox Uploader is a bash script that allows you to perform various actions on your Dropbox (upload, download, delete, share, etc.) without installing the Dropbox client. This is useful for servers, automatic backups or accessing Dropbox from ARM devices, like Raspberry Pi. The script was updated recently, getting a copy function, a "-s" option to skip existing files when uploading/downloading (files are overwritten by default), along with other changes. Since our last article about Dropbox Uploader, the script has received numerous improvements, including support for downloading and uploading directories, move/rename function and more. The latest Dropbox Uploader 0.12 supports the following commands: upload, download, delete, move, copy, mkdir, list, share, info and unlink. There are also some optional parameters, like the newly added "-s" to skip already existing files when uploading or downloading, "-p" to show curl progress meter and more. enter the app name provided by Dropbox Uploader. For more information, bug reports, etc., see the Dropbox Uploader GitHub page.